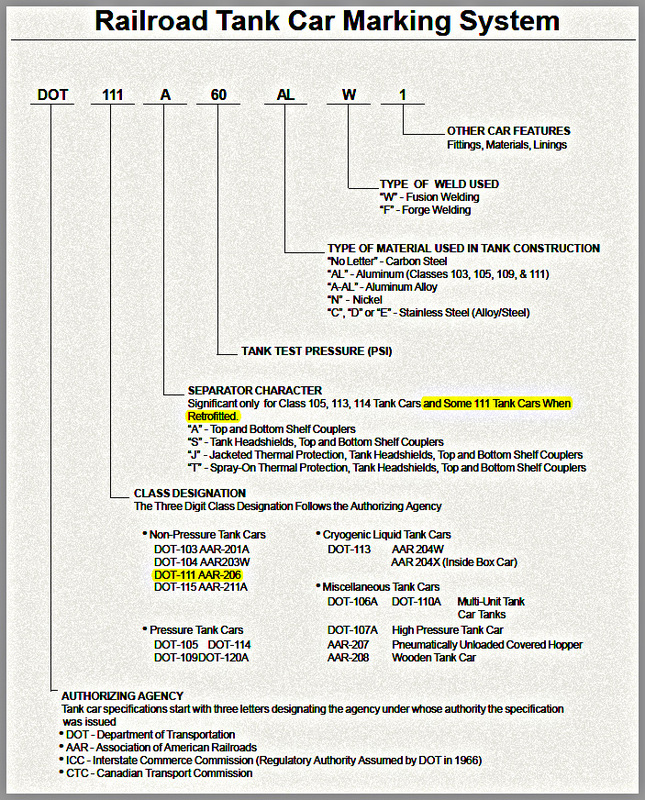 Oil-Electric: MM&A: Mislabeled Hazardous Cargo! 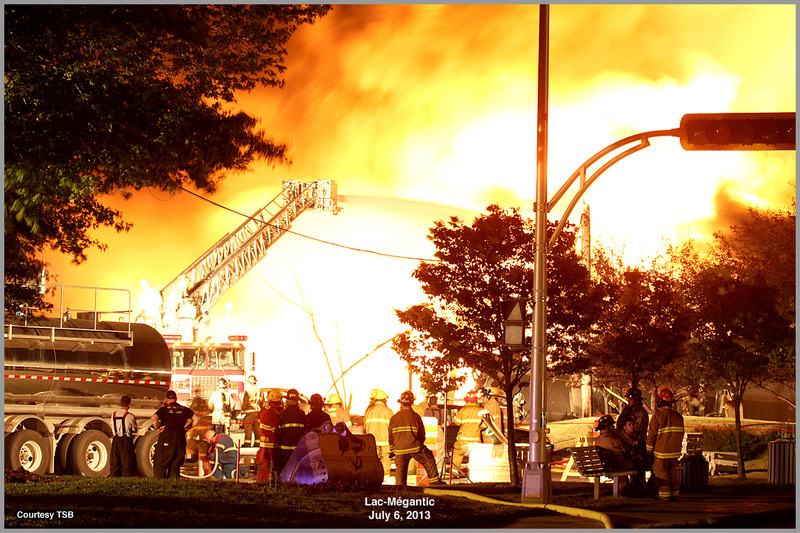 "Crude oil really isn't supposed to explode. 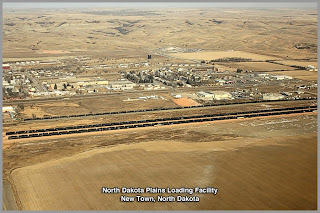 But according to an article in Bloomberg on the investigation of the MM&A train accident that might not be true of the oil coming from North Dakota's booming Bakken region. Well. 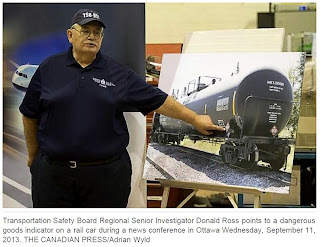 today (Wednesday 9-11) the Canadian Transportation Safety Board (TSB) said the oil contained in the rail cars involved in the Lac-Mégantic disaster in July was mislabeled and was more flammable than previously thought. “The lower flash point of the crude oil explains in part why the crude oil ignited so quickly,” said Donald Ross, the lead TSB investigator on the Lac-Mégantic disaster. Petroleum crude oil is considered a dangerous good and is categorized into one of three groups ranging from Class 1, which is the most flammable and volatile, to Class 3, which is the least. The TSB determined over the course of its investigation that the crude being transported in the Lac-Megantic disaster was mislabeled as a Class 3, or Packing Group III product, when in fact it was a Class 2, or Packing Group II product. A placard provides a variety of information through several different methods. The first information indicator is the color of the placard. Red indicates flammable, green indicates nonflammable, yellow indicates oxidizer, blue indicates dangerous when wet, white indicates inhalation hazard and poison, black and white indicates corrosive (acid and caustic), red and white indicates flammable solid or spontaneously combustible, depending on the color pattern on the placard, white and yellow indicates radiation or radioactive, orange indicates explosives, white with black stripes indicates miscellaneous hazardous materials, and there is another red and white placard that says “dangerous” on it. The third information indicator is the symbol in the upper corner of the diamond. A variety of symbols are used to indicate combustion, radiation, oxidizers, compressed gas, destruction of materials and skin by corrosives, an explosion, or skull and cross bones to indicate poisons. 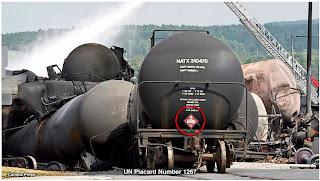 In the case of the MM&A oil train, the placard on the tanker reads UN ID Number is 1267. Crude Oil. 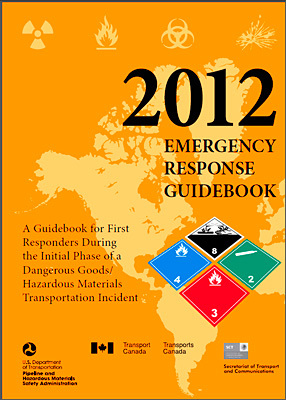 Most "first responders" carry the Emergency Response Guide Book in their vehicles, which is the "last word" on hazardous materials, their characteristics, and how to deal with them when involved in a spill or fire. To demonstrate how this Guidebook works, open the Guide Book link (.pdf) above to Guide Number 128, to see the hazards associated with Crude Oil, and remedial response. 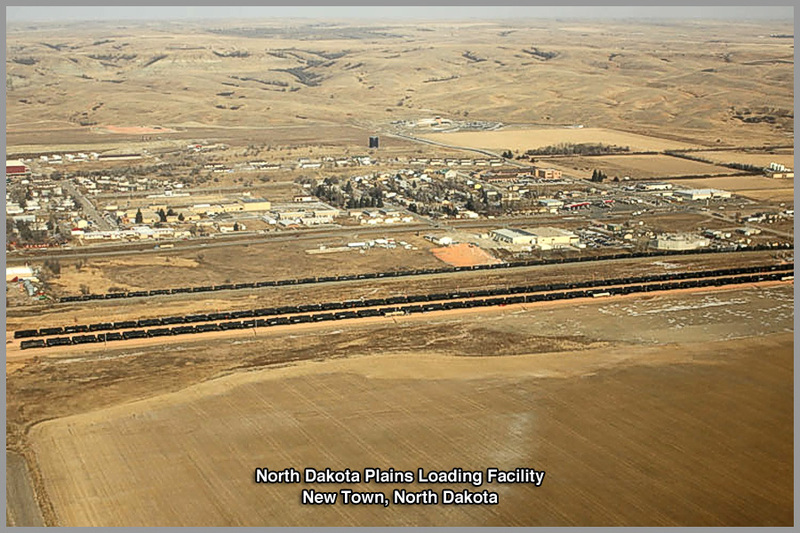 At the same time, because there were different wells involved in supplying the crude involved, the crude was labeled in several different ways on their initial material safety data sheets [MSDS]. 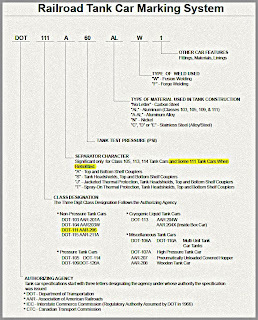 Investigators reviewed 10 different msds's, and some reported the goods as Class 1, Class 2, and Class 3, and other with no classification whatsoever! The derailment also draws into question the safety of transporting similar goods in the controversial 111A rail cars involved in the disaster. 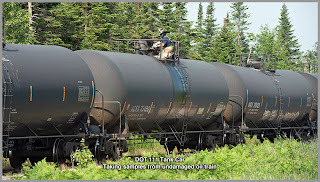 The TSB has been pushing since 2004 for a more resilient type of rail care to be used than the current 111A tank cars commonly used in Canada (and US) to transport goods. A similar effort is afoot in the U.S. because the 111A cars have thinner walls and lack the head shields or housings that help prevent damage in the event of a derailment and are commonly available on newer rail cars. One rail-safety advocate even called the DOT-111 the "Ford Pinto" of rail cars. 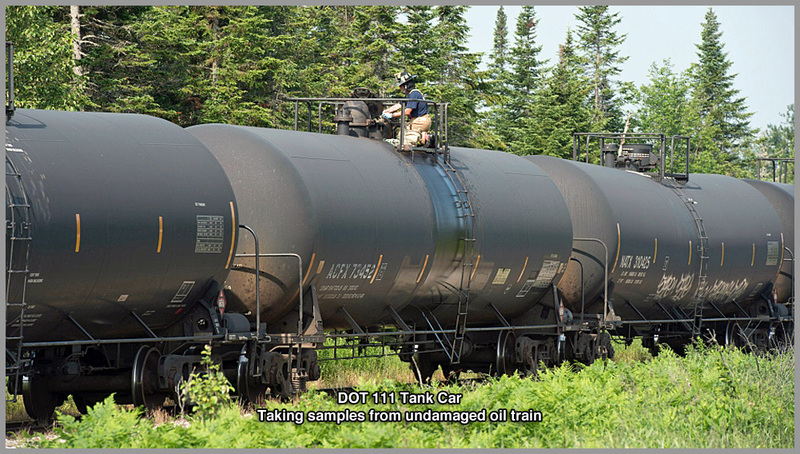 69% of tank cars on North American rails are DOT-111 specification. Finally, the Montreal, Maine & Atlantic track condition has become the focus of attention. 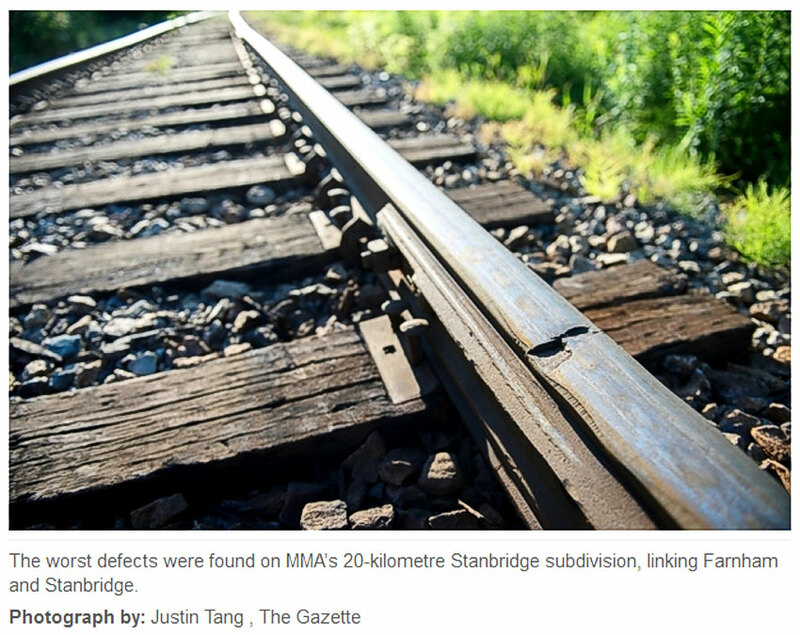 I cannot imagine a sane person allowing a hazardous material train to operate on such junk. "At the TSB we hold by the theory that no accident is ever caused by one thing, it's always a series of things. It always involves the organization and the way that they operate, so we have to look deeply into that. It never comes down to one individual."